Sodak Angus was homesteaded in 1909 by our grandfather, Otto Meyer, and a pure bred Red Angus herd was introduced in 1958 under the management of our father, Raymond Meyer. In 1971 the first purebred Black Angus females were introduces which became the foundation of today's cow herd. Currently the ranch is managed by Vaughn and Lois Meyer and their son Jeffrey. 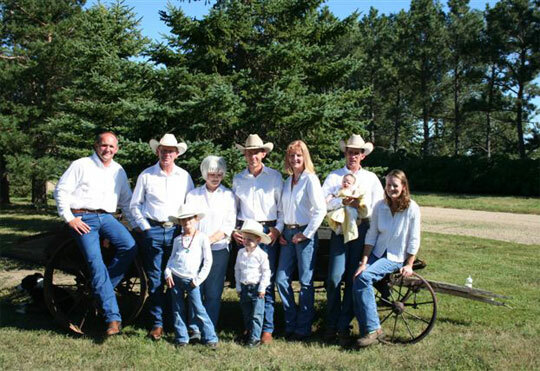 Sodak Angus is a family operation with assistance from daughters Jessica, and Jeny and their families. We also have a fellow Angus breeder, Austin Risty and his family who assist with the daily activities along with managing their own Angus herd. We are located 12 miles southeast of Reva, SD near the Slim Buttes range of the Custer National Forest District. We receive an average rainfall of 13 inches annually and in addition to the native grasses we grow alfalfa, oats, corn and barley for livestock feed. Our goal is to provide superior genetics and service to maximize profitability, pride and convenience within our customer's herds. To achieve our goal we select sound proven genetics with high accuracies which are balanced for the maternal, growth and convenience traits alike. Our cow herd is bred and raised here on the ranch under extreme environmental conditions to insure soundness and adaptability in our customer pastures. At Sodak we maintain two herds of Red Angus and Black Angus consisting of 600 mother cows. Both herds are managed in a fall calving program which allows us to maintain them in their natural element. Under the fall calving program the heifer and bull calves are grown and gain tested on a high roughage ration which promotes soundness. We market the bulls in our production sale on the third Sunday in February at the ranch. The sale includes 18 month bulls from the Sodak herd and yearling bulls from Austin's herd. We also merchandise some heifers in the February sale and throughout the year by private treaty. The Sodak breeding program is focused upon multi-trait selection to produce predictable genetics which compliment the commercial cowman's needs throughout all segments of our industry. We utilize both artificial insemination and embryo transfer to facilitate the incorporation of new genetics. We also enlist the use of production records, ultrasound and residual feed intake (RFI) to monitor herd progress. We thank all of our customers whose programs are the proving grounds for our program. Every customer is important to us and each sale is backed with integrity and service throughout the year. We appreciate your past support and look forward to assisting you with your future genetic needs. Thanks for visiting our web site and we hope you can schedule a visit to our ranch and a personal tour of the cow herd.